Barcelona president Joan Laporta says his club views the signing of Cameroon striker Samuel Eto'o as a priority. 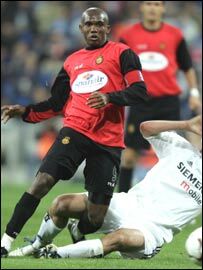 The African Player of the Year is part-owned by both Real Madrid and his present club Real Mallorca. "We see no problem in signing a player that does not have a place at Real Madrid," Laporta said on Wednesday. "We think Eto'o is a great player." Last month, Barcelona's technical director Txiki Begiristain revealed that his club had made an offer for the Indomitable Lion. Yet the Catalans have a tough battle on their hands if they want to secure the services of the highly-rated 23-year-old. Before he was re-elected on Sunday, Real Madrid president Florentino Perez said he intended to buy back the full rights to the player from Mallorca and then loan him out to another club. But he ruled out any deal with Barcelona. However, Laporta has insisted he will not be deterred by Real's plans. "Everything will now depend on the how strong the desire of the players is to join Barcelona," the club president said. "It is in our interest that he ends up playing with us." One additional problem for Barca is that Eto'o does not have a European Union (EU) passport and so would have to occupy one of three berths assigned for foreign players under regulations in Spain's top flight. Barca have already exceeded their quota of non-EU players and have said that unless new signing Brazilian-born Silvinho manages to obtain Spanish citizenship before the start of the season, they will have to loan him out to another club. As well as the Celta Vigo left-back, Barca have also signed fellow Brazilian defender Juliano Belletti, Portugal playmaker Deco, Sweden striker Henrik Larsson and French midfielder Ludovic Giuly during the close season.